and also for digital download on Kindle, Nook and iPad. 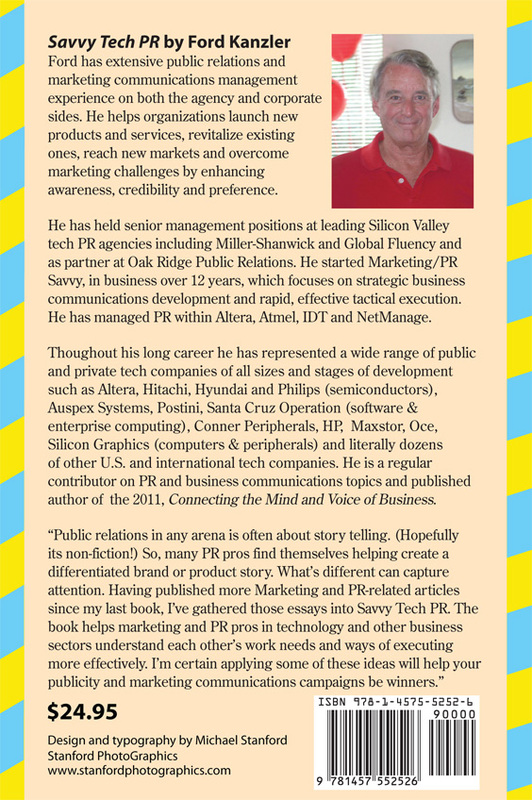 The reason for Savvy Tech PR is the same as my last book, Connecting the Mind & Voice of Business. Its about sharing ideas that help unite tech marketers and PR pros so they can work more effectively and even perhaps enjoyably together. Marketing and PR teams often treat each other as “Them” and “Us.” The gulf between the two professional specialties often remains too wide. This book should also be helpful to people working in both those areas of business with some fresh perspectives and alerts to typical pitfalls. The essays or chapters are all previously-published in media such as MarketingProfs, PR News, PR Week, EBNonline, Understanding Marketing and elsewhere. My goal was rounding these stories up as a convenient, tangible reference. Its certainly not the last word on PR or marketing in the tech sector. But all the items relate to some aspect of marketing and public relations practices in the tech sector...primarily as its been and being done in Silicon Valley. I've worked my entire career with literally dozens of tech start-ups, established brands and global marketers. While focused on tech, there's also lots of useful ideas for people working in any area regardless of their industry, whether commercial, non-profit or government PR rolls. My perspective is that Marketing and Public Relations are intimately connected. They need each other. Some PR pros may disagree and that's fine but consider what a PR agency would do without clients who are marketing a product, stock, a service or an idea? 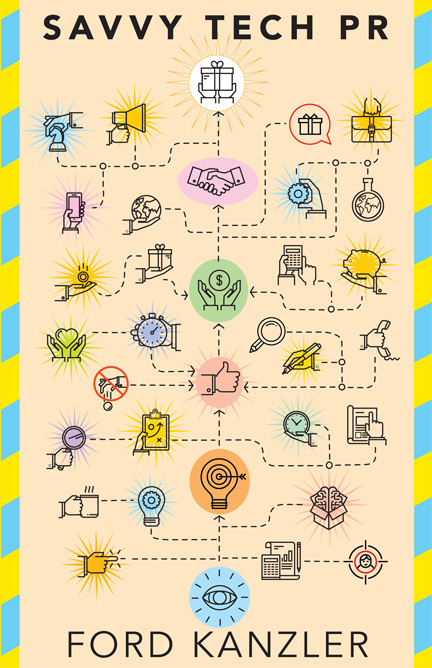 Whether you see a connection or not, the two areas clearly work together on common goals. I'd also suggest Marketing has a PR program whether they manage it and apply specialized expertise to it or not. If they don't manage it, its likely their competitors will help them do it. So this book should provide ideas about how to reduce friction and create better understanding between Marketing and PR pros for more effective and perhaps even faster execution. The book includes two main sections – Inside and Outside. The first part gets at things you need to handle within your organization to be well prepared for campaign execution. It focuses on management participation, understanding, strategy creation and plan development. The second part discusses pointers on getting the job done, tactical execution...the how, why and how well your business engages with the market in the outside world. Read one or the other first. Jump back and forth. The main thing is getting your team on board with some of the key ideas. The result will hopefully be everyone playing the game considerably better than before and more consistently winning battles for prospects' and customers' minds against ever-tougher competition. I hope you find this book serves that purpose. There's also an extra section – End Papers– that's quite relevant to PR and Marketing team members working well together and on the nature of public relations, which remains an exceptionally misunderstood business specialty.